A US guided-missile destroyer has collided with an oil tanker off the coast of Singapore, the US Navy says. 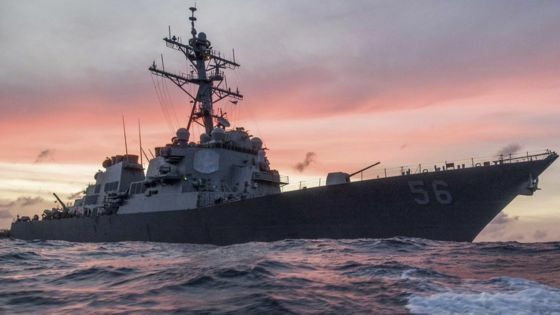 The USS John McCain was approaching the port in the Strait of Malacca, near Malaysia, when the incident occurred, the US Navy said in a statement. It is unclear if anyone is missing but a search and rescue operation is under way, the navy says. The incident on Monday is the second serious collision involving a US Navy ship within two months. The latest collision, which was reported at 06:24 local time on Monday (21:24 GMT on Sunday), happened as the USS John McCain prepared to perform a routine port stop. Initial reports said that the ship had "sustained damage" to its port side when it struck the Liberian-flagged vessel. The US Navy said local authorities were assisting with "search and rescue efforts". In June, seven US sailors were killed when the USS Fitzgerald collided with a container ship in Japanese waters near the port city of Yokosuka. Those who died were found in flooded berths on board the ship after the collision caused a "big gash" under the warship`s waterline, the US Navy said. According to maritime rules, vessels are supposed to give way to ships on their starboard side.